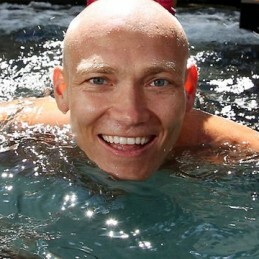 A multiple Olympic and World Champion, Michael Klim was part of the star-studded group that has taken Australia back to the top of world swimming. Named Australian Swimming Rookie of the Year in 1995, Klim won a bronze medal at the Atlanta Olympics. His star continued to rise in 1997 when he took the World Record in the 100-metre butterfly on the way to being named World Swimmer of the Year. At the 1998 FINA World Championships in Perth, Klim’s record haul of seven medals in seven events including four gold rates as one of the most outstanding performances by an Australian at an international swim meet. The 1998 Commonwealth Games in Kuala Lumpur saw Klim exert his dominance, winning seven medals including four gold once again. Klim was one of the undisputed stars of the Sydney Olympic Games with two gold and two silver. He was instrumental in the Australians’ thrilling 4x100m relay victory, unleashing a world record lead off swim to win his first gold on the first night. Klim later helped smash the world record in the 4x200m relay to win his second gold. Back in the pool in 2001 at the FINA World Championships, Klim showed he had not lost his golden touch, winning two gold medals and setting a world record in the 4x200m freestyle relay. An amazing effort for a man who only days earlier had seriously injured his ankle. In a win for perseverance, Klim returned to the Australian team for the 2004 Athens Games. One of three triple Olympians in the squad, Klim won his sixth medal as part of the 4x200m Freestyle Relay. Klim’s return to the upper echelon of the sport became official at the 2005 World Championships in Montreal, with a bronze medal in the 4x100m freestyle. He continued his spectacular comeback at the Melbourne 2006 Commonwealth Games where he won gold in the men’s 4x100m Medley Relay, silver in the 4x100m Freestyle Relay and 100m Butterfly and bronze in the 50m Butterfly. After a great career, Michael announced his retirement from the sport in June 2007 with his body unable to continue through to a fourth Olympic Games. Michael now focuses his energies on his business MILK skin care and guest speaking.